In Dreii, players will work together to build a tower while fighting against gravity. Developer Etter Studio and publisher Bitforge have announced the upcoming release of Dreii, a multiplayer puzzle game for mobile devices, home consoles and PC. A first concept study for the title, called Drei, was released on iOS in 2013, and received multiple awards from critics. 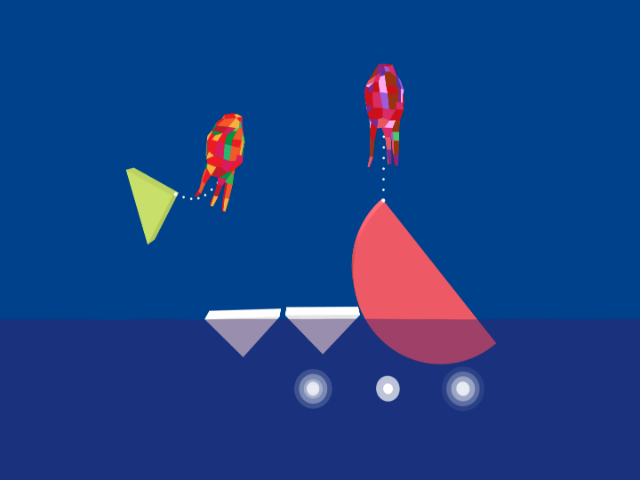 In Dreii, players will work together to build a tower using various shapes while working against gravity. Dreii ‘secretly’ connects users to other players around the world in real-time. The cross-platform experience will allow mobile gamers to play with console or PC players, and vice versa. This new version of the game will feature faster physics, new levels and a new character specifically created for Dreii. Since the game connects users on a global scale, Etter Studio has created a ‘universal communication tool’ for Dreii. We settled on a hand-full of words that we thought would help [players] to communicate with each other while completing the levels together. These words were translated into 19 different languages, from Hindi to Spanish. We even included an old Swiss language lying at the brink of extinction with only 40,000 speakers left worldwide. This simple but effective system allows everybody to communicate [quickly] and intuitively, without having to know each others’ languages. Dreii is expected to release this fall on iOS, Android, PC, Mac, the PSN Store for PlayStation 4 and Vita and the Nintendo Wii U eShop.